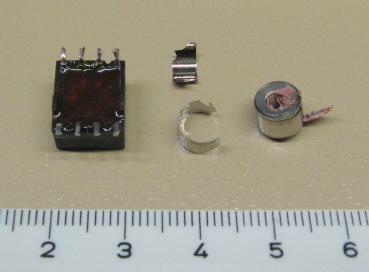 In our local radio club we have a substantial number of identical small "second-hand" transformers, one of which I took apart, out of curiosity. Of course I expected to find a ferrite core inside, but that did not come true. There was in fact a toroid, but made from a material that was as shiny as aluminium foil, and that also looked like it consisted of a roll of foil, see the picture. But it surely is not aluminium foil: it is very fragile, and is attracted by a magnet. Bob, ON9CVD explained it to me. Nowadays there are "nano-crystalline" materials which are used among others for such toroidal cores. The figure (after ) shows how such materials are made: a metal mixture (containing e.g. iron, silicon, niobium, etc.) 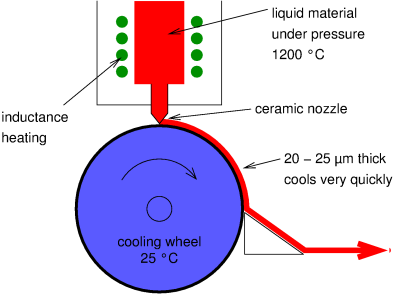 is molten and flows under pressure in a very thin layer onto a water-cooled wheel, causing it to cool down very quickly. Due to that quick cooling down the magnetic domains (parts of the material where the elementary magnets all have the same direction) do not get a chance to become large, giving the material unique magnetic properties. Relevant for us is mostly the high permeability, giving much inductance for few turns of wire, which however reduces at higher frequencies; also the losses increase with frequency. So this material is not so suitable for a precision inductor, but it can be used for many kinds of transformers and chokes. Whether toroids of this material are for sale in regular retail shops, I don't know; I've never seen them on amateur radio flea markets. Martin Ferch: Softmagnetic materials in todays power electronic designs, http://www.magnetec.de/fileadmin/pdf/nanoperm.pdf.